The first mobile Pokémon title for iOS and Android has proven to be a wild success, helping to boost shares of Nintendo stock after a pervasive slide, with the game on track to expand to Europe, Japan and more in the coming days. Pokémon Go, developed as a joint effort between Niantic and Nintendo, first launched on iPhone last week, and has remained atop the App Store charts since. While it's only available in the U.S., Australia and New Zealand at the moment, the mobile Pokémon title is expected to launch in Europe, Japan and other countries in Asia "within a few days," according to The Wall Street Journal. It's estimated that Pokémon Go is bringing in between $3.9 million and $4.8 million per day based on in-app sales. 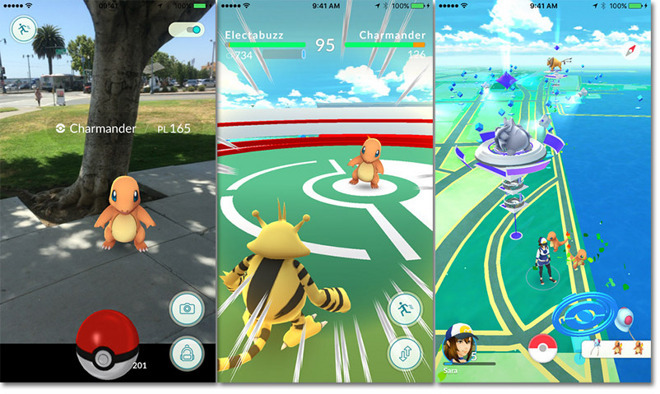 The free-to-play game allows players to capture and train virtual Pokémon who appear throughout the real world. Following a successful capture, the user is rewarded with not only the virtual creature, but one of two types of in-game currency needed for progression, which are also available as in-app purchases. Overwhelming demand for the title prompted Niantic and Nintendo to announce last week that the planned launch in Europe was "paused," as the companies work to address server problems. Shares of Nintendo climbed 8 percent last week, adding $7.5 billion in value, as investors are encouraged by the success of the Japanese game maker's expansion onto smartphones. So far, it's estimated that Pokémon Go is bringing in between $3.9 million and $4.8 million per day based on in-app sales, according to CNBC. Wireless companies may be seeing an impact from the game as well, as Pokémon Go data usage ranges from 2 to 8 megabytes an hour. AppleInsider has learned that Washington DC-area AT&T cell towers has seen a noticeable increase, with 8.2 percent more data transmitted daily to mobile users since the game's launch last week. Developer Niantic was an internal startup at Google. The development house is also responsible for augmented reality title Ingress, and was spun off from Google in October 2015 during the Alphabet restructuring. While the game is encouraging users to get outside, and outside their comfort zones, there are some downsides as well. The "beacon" feature in the app was used in O'Fallon, Missouri to lure users to a location. Upon arrival, they were greeted by four of armed teens, and robbed. The quartet was arrested, and were responsible for 11 thefts using the strategy. Public safety officials are also warning users to be mindful of their surroundings. There have been many reports of injuries from distraction by the title, leading to accidental injury. While there has not been any widespread reports of distracted driving accidents being directly caused by the app, the potential clearly exists. Real-world locations have no control over how their location is being used by the app, which has led some businesses to use the game to entice customers to visit. Northwestern State is using the fact that the university has "plenty of Gyms and Pokestops" on campus to entice users to tour their campus. Twitter and social media posts are abound with offers of discounts and other promotions. 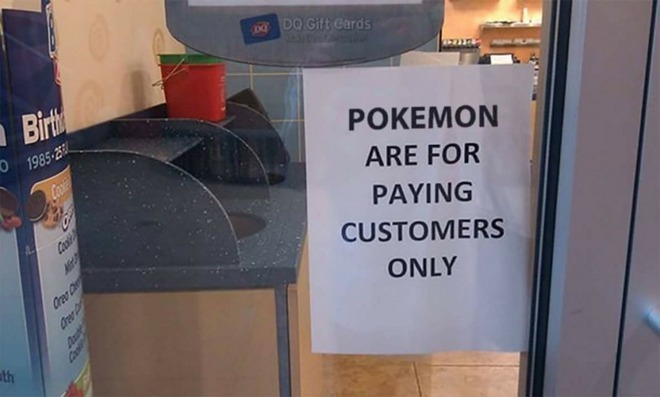 One Dairy Queen location gained attention after it posted a sign saying Pokémon found on its premises were for paying customers only. Using crowdsourced data from "Ingress," many of the landmarks featured in Pokémon Go are misidentified. For example, Twitter user Boon Sheridan lives in a converted church in Holyoke, Mass., and said have been people driving up to his house and sitting outside in their car to play the game. Niantic allows for people to report a location if there is an "immediate physical danger" only. At this time, it is not allowing database removals for other reasons. The app itself does not allow for trading between users, or users fighting the Pokémon directly, both staples of the game franchise. Additionally, Bluetooth low energy peripheral is coming soon, called the Pokémon Go Plus. The wearable button will allow for use of the game without having to continuously focus on a phone. It is expected to ship on July 31, with pre-orders underway.